Daylight lamps are expensive. I had been saying for years that I was going to buy one but I hadn’t quite gotten around to it. I used one, once, when I had a flatmate who kept his in the communal kitchen /livingroom so I know what a difference they can make. After I moved out, I’d researched them to decide which to buy and came across dawn simulators like the Lumie bodyclock alarm clock. These are designed to make your body “see” a sunrise at about the time your alarm clock would go off, so that you wake up more slowly and naturally (rather than being jolted out of sleep, mid-REM, by an alarm clock buzzer). In the Scottish summertime, I keep the curtains and blinds closed tight, trying to keep out the 11pm sunset and 5am sunrise (it’s too bright for me to easily fall asleep and stay asleep). In the winter, those handful of daylight hours are just not enough for me to ever feel awake. Dawn simulators, unlike just keeping the curtains open, switch on at the same time every morning — so, despite the seasonal differences, I can keep the curtains closed tight and the room dark and I’ll still have a sunrise for when I need to wake up for work. A few years ago (has it really been a few years already?! ), I’d seen a Lifehacker article about under-bed lighting. I showed it to my partner who thought it was a nifty idea so we plugged a multi-colour IKEA strip light in under our Malm bed and set it to red so that it would be dark enough that it would be only just visible at night. A short time later, my partner and I had watched a BBC Horizon episode on how humans perceive colours. It turns out that blue light makes your brain think it’s dawn! 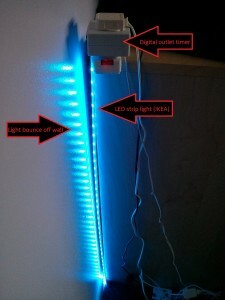 We put two-and-two together, switched our LED lights from red to blue, and plugged the whole thing into an outlet timer. Voilà! Instant daylight alarm clock! Our current setup doesn’t have the lights under our bed, because our current bedroom is too small and the light doesn’t bounce around the room enough to wake us up. Instead, the light is behind the dresser, bounces off the semi-gloss painted walls, and lights up the whole far end of the bedroom. It’s not the most ideal setup, because some mornings the faint “click” sound made by the outlet timer switching on wakes me up (if I’m in a particularly light sleep at the time), but it’s a lot better than waking up to a buzzer every day! We’ve been waking up to this for a few years now and it works a treat. About 15 minutes after the light turns on, the radio also switches on using a timer (tuned in to the peaceful classical music of BBC Radio 3) — but we’re usually already awake by then so we can enjoy the warmth of bed whilst we listen to the news headlines. We have it set so that it doesn’t switch on at the weekends, but we barely sleep in more than 30 minutes, now, because our bodies have gotten so accustomed to waking up at a certain time. When the clocks changed, though, it only took us a few days of gently waking up earlier than we’d like before we were on the new schedule. I’ve never been a morning person, but I can wake up now without the grumpyness and anger at the alarm clock. I may still be tired if I haven’t gotten enough sleep, but at least I won’t be groggy. Someday I’ll get a daylight lamp, to leave in the livingroom to have some “sunshine” in the winter evenings but, for now, this is enough.